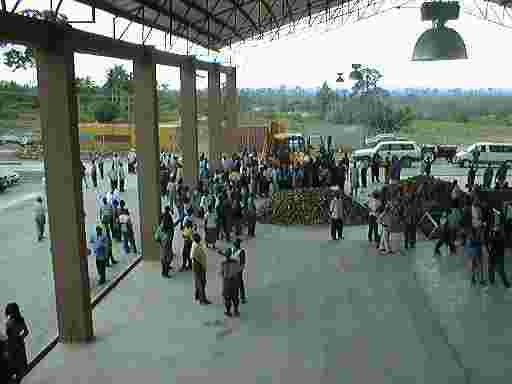 The ECOWAS factory was largely a copy of a cassava starch factory as we previously based in South Africa near Dendron. This factory was the first African factory, which produced high-quality starch in Africa, but only for domestic consumption. This market is still not saturated. More about the Dendron factory. - to be the first producing high grade tapioca starch for the export market. 2003 a new ECOWAS factory began manufacturing native high grade cassava starch. 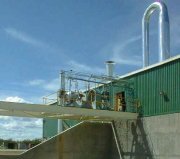 The starch is produced on equipment supplied by International Starch Institute, Denmark and will meet the highest standards. If you see any business opportunity in selling/distributing/consuming part or all of the starch in your country or elsewhere, please let us have a few words on your ideas and capacity - this may be the beginning of a new venture. 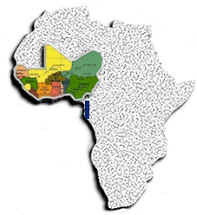 The Economic Community of 15 West African States was established by the Treaty signed on 28 May 1975 in Lagos (Nigeria). ECOWAS ensures free trade among member states. 2003 one ECOWAS member state raised production of native cassava starch in excess of her own demand. Starch will be available for export - free of duty - to other ECOWAS countries. President Clinton signed the African Growth and Opportunity Act (AGOA) into law on May 18, 2000 as Title 1 of The Trade and Development Act of 2000. The Act offers tangible incentives for African countries to continue their efforts to open their economies and build free markets. President Bush signed amendments to AGOA, also known as AGOA II, into law on August 6, 2002 as Sec. 3108 of the Trade Act of 2002. AGOA II substantially expands preferential access for imports from beneficiary Sub-Saharan African countries. Trade with the European Union (EU) based on the ACP (African-Caribbean- Pacific)-EU agreement - then the Lom Convention - allows one-way duty-free or duty reduced import of most products inclusive starch. The Far East countries are NET importers of starch. Products, however, must match the high quality and production standard from Europe - a major exporter. That quality - and quality control - is guaranteed. South Africa is a large starch producer of cornstarch, but imports cassava starch to cover its needs. The ocean distance is short and the duty fair.